DON'T eat too much blackened and charred meat. Choose the leanest cuts of meat such as tenderloins and flanks. When choosing ground beef, purchase the kind with a lower ratio of fat (90/10). Marinade meat for moisture and prevent charring. This advice from Lisa Cimperman, a clinical dietitian at Cleveland's University Hospitals Case Medical Center, may sound familiar. If not, these are tips for grilling foods in ways that aid weight loss and promote general good health. Essentially, to slim down while filling up on good food. After all, it's (almost) summertime (21 June) and the grilling should be easy. "Marinade vegetables and the grill caramelizes the natural sugars, enhancing the natural flavors in zucchini, squash, portobello mushrooms, peppers and tomatoes," says LC. "That's a great way to cut back on calories in your diet and fill-up and add some really great nutrition as well." LC encourages leaner cuts of meat protein for the obvious reason that they are healthier but also because they are healthier. Melting fat causes flare-ups on the grill which chars meats and carries the risk of creating carcinogens (cancer causers). Yikes! 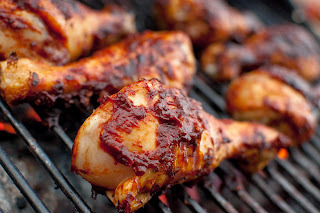 Leg of chicken can replace leg of lamb, for instance, on the grill. 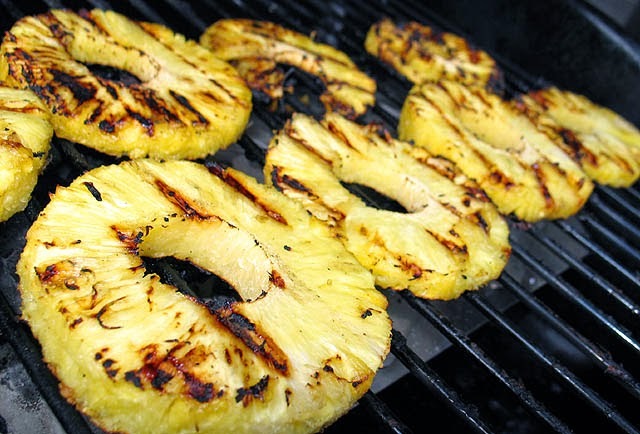 *Grill fruits like pineapple or peaches over frozen yogurt for dessert. 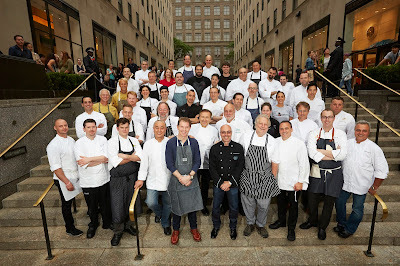 Citymeals-on-Wheels chef's class of 2014 on the steps of Rockefeller Center. Photo courtesy of Hart Media. AFTER feeding relentlessly on Jean-Georges Vongerichten's niftily packaged lobster sliders (a la Mickey D's), we retired to the VIP section in The Sea Grill to sip vintage Tattinger and slip into a deep food and wine coma. Sea Urchin Toast with Robiolina and Jalapeno from Craig Koketsu. Photo courtesy of Hart Media. This particular bacchanal was in support of a good cause, specifically the 29th Annual Chefs' Tribute to Citymeals-on-Wheels. “Summer by the Sea” was this year's theme, and last week the rink at Rockefeller Center was beautifully done up by iconic architect David Rockwell. 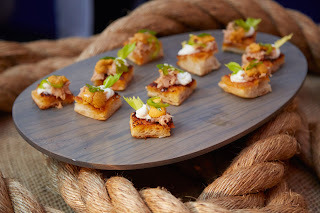 There was plenty more at “Summer by the Sea” to sink the teeth into, for instance Craig Koketsu's Sea Urchin Toast with Robiolina and Jalepeno, from a who's who of world-class chefs. Daniel Boulud, who posed for fan pix for hours, obliges stricken Chef Melody McGinley Whitelaw with a get-well "card." Photo by Joel Levin. Among others minding the stoves: Michael Anthony, Daniel Boulud, Leah Cohen, Stephanie Izard, Matthew Jennings, Elizabeth Karmel, Nobu Matsuhisa, Laurie Jon Moran, Silvana Vivoli, Michael Voltaggio, Jonathan Waxman, Jennifer Yee and Damon Wise, as well as Sang Yoon. 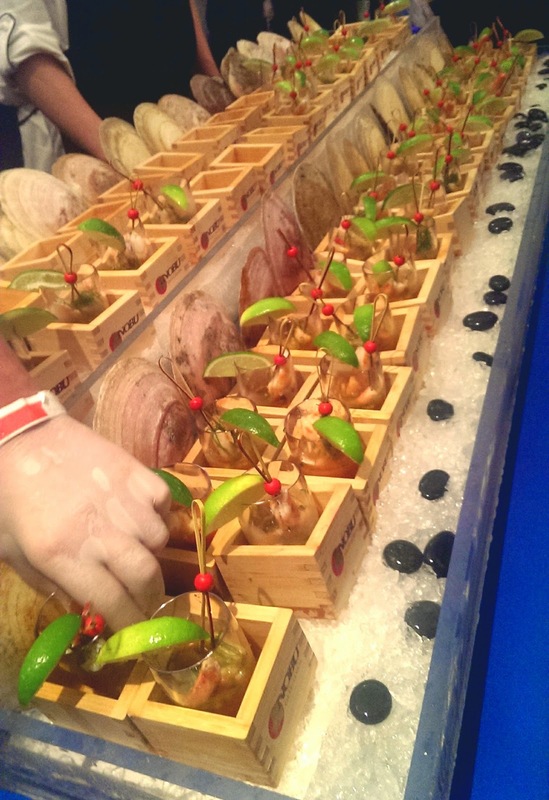 Artisans from Nobu line up beautiful lime-garnished seafood shooters. Almost 50 restaurants from around the United States offered menu samples at "Summer by the Sea." Photo by Joel Levin. 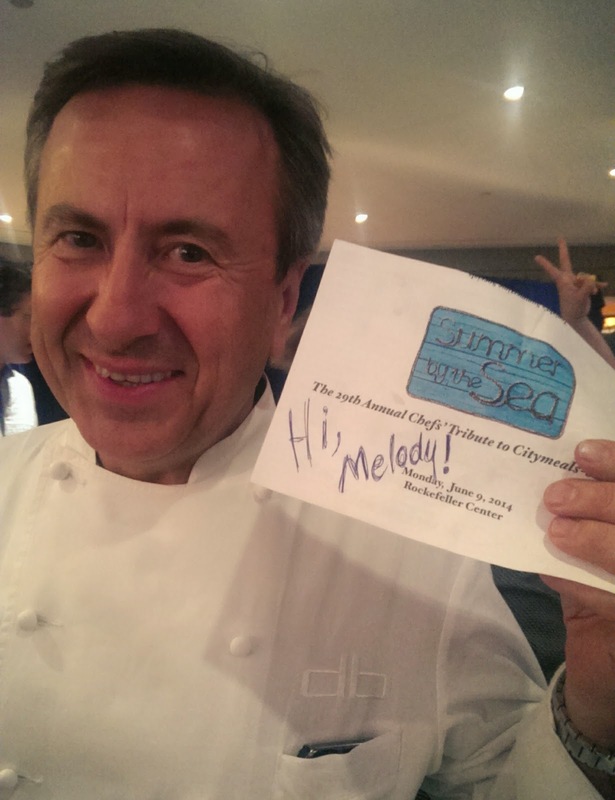 An ultimate foodie fantasy, “Summer by the Sea, the 29th Annual Chefs' Tribute to Citymeals-on-Wheels” raised more than $800,000 for the worthy charity. Visit http://www.citymeals.org/ to learn more about Citymeals-on-Wheels. har-Broil TRU Infrared Electric Patio Bistro 240…. ... Giantex 1350W Electric BBQ Grill Non-stick w/4…. ... Here you can discover the best Outdoor Electric Grills Best electric grills of Weber- Re-invent your grilling style!